Fire Door Safety Week takes place at the end of next month, which is why we thought that it was an ideal time to discuss the importance of fire detection systems! Every year, fires cause irreparable damage to public spaces, commercial properties and domestic dwellings, costing millions in lost assets, and in the worst cases, causing life-changing injuries and death. Having an efficient fire detection system in place is vital in preventing fires and stopping them from spreading, allowing you to take action as soon as the risk is present. Ensuring safe notification and evacuation of staff/occupiers/members of the public. Alerting emergency services for an efficient response. Detecting the location of the fire to ensure that the correct action is taken, and to plan for a safe evacuation. Minimising the scale of the loss/damage. Ensuring that public and private spaces meet the correct health and safety standards. 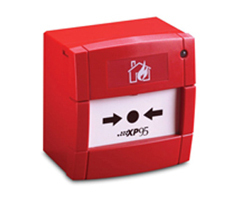 Here at IDS, we have provided advanced fire detection solutions for over 20 years, installing fire alarm systems in commercial, public and residential properties throughout England and Wales. From conventional formats, to larger networks, we can provide a range of options, including a 24/7 monitoring and engineering service for ultimate security and peace of mind. If you would like to like to find out more information about our fire detection systems and monitoring service, you can get in touch here for more details, or to request a free quotation. If your business is based in Gloucester (or the broader Gloucestershire area), IDS Security Systems Ltd are here for you. We specialise in the design, installation, and maintenance of cutting-edge security systems that are specifically tailored to each client's unique requirements. In addition to the above services, customers who opt to take out an IDS maintenance contract also benefit from our 24hr call-out monitoring and engineering service. Our experienced engineers are on call at all times - simply call 029 20 753 251 at any time of the day or night and we'll be ready to spring into action. At IDS, as well as providing commercial and domestic security solutions, we also provide more advanced systems for high-security facilities, such as prisons and correctional institutions. As an accredited provider that is committed to providing the most reliable and advanced solutions, we are able to supply security systems for even the most demanding environments, ensuring that order is preserved at all times. Whether this calls for specific area monitoring, or a large network of complimentary solutions used in combination, we are able to provide high quality security and monitoring that can be relied upon to deliver safety and control. As a testament to our professionalism and the quality of our services, we can proudly say that we have provided systems for Her Majesty’s Prison Service – a Government regulated institution that will only accept the highest of standards. Whether you require area monitoring, access control or security barriers, we can provide a combination of high-quality systems to ensure the safety of both staff and inmates, as well as prison visitors. At IDS, we understand how vitally important it is to preserve the level of security at these facilities, and fully appreciate that the success of the system, its integrity, and the safety of the general public rely heavily on the systems in place. If you are interested in hearing more about our work with Her Majesty’s Prison Service, or if you would like to find out how we can provide prison security systems for your facility, please get in touch to discuss your requirements. You can reach us on 02920 753 251, or by filling out our quick enquiry form. Increasingly, the safety and security of pupils is becoming a growing concern for educational institutions, as the welfare of students becomes a fundamental responsibility for teachers, outside of the classroom as well as during teaching hours. Particularly in larger institutions, it can be difficult to monitor the behaviour of students, as well as ensuring that the school grounds are secure at all times. With a CCTV system in place, it becomes far easier to monitor multiple areas at once, maximising the abilities of staff to provide a safe and sheltered space for pupils. Grants the ability to monitor and deter bullying. Provides evidence of vandalism, truancy, misconduct and more, while also acting as a deterrent for this behaviour from students and members of the public. In the same instance, it can also bring false claims to light. Monitors and prevents intrusion or interference from outsiders, minimising the risk to pupils on a general and individual scale. Compliments and improves existing security features, such as restricted entrances and intruder alarms. Preserves the security of the area outside classroom hours, ensuring staff and pupil safety during after school activities, and providing evidence of any interference to the facility that could present a risk or prove disrupting to students. If you require a highly reliable and technologically sound CCTV system for your school, we offer a variety of options to suit the requirements and demands of the facility in question. Whether you wish to update or expand your existing security system, or build a network of up-to-date surveillance solutions from scratch, the experienced team at IDS can help you achieve and maintain your desired result. To find out more about CCTV for educational facilities, or to request a quotation, simply get in touch by filling out our quick and convenient enquiry form here. Do you operate a public car park and need an efficient means of letting motorists in and out? Or perhaps your office has a private car park and you wish to prevent unauthorised personnel from parking there? Whatever your requirements, we at IDS Security can provide an elegant solution. We supply and install a variety of cutting-edge security barrier systems that are ideal for managing access to car parks. No matter how many people park on your premises each day - and whether they're your employees, your clients and visitors, or just members of the general public - we can provide a solution that's perfectly suited to your needs. Contact IDS now to request a quotation for your car park barriers, or read on to find out more about the solutions we offer. Our car park barriers are manufactured by FAAC and CAME, two of the UK's leading suppliers of automated gates and security barriers. Your automated vehicle barriers can be controlled by radio or integrated into a full access control system for unrivalled efficiency and ease of use. We don't just supply the barriers - we install them, too, and if you opt to take out a maintenance contract we offer a 24/7 monitoring and engineering service to ensure that things always run smoothly. We can also supply a range of other vehicle barrier systems, including rising bollards. If you need a state-of-the-art barrier system for your car park, give IDS Security a call on 029 20 753 251 or fill out the enquiry form here. You can also reach us via email on admin@ids-securityltd.co.uk.